820 Hammered (5). Henry VIII groat, 3rd coinage, Bristol mint, together with 3 Edward I pennies and a John short cross penny, class 6a, moneyer Willelm on London. Mostly fine, the groat has some scratches on the obverse. 1926 Short cross Pennies (4) of John, Richard and Henry III. Fair to good fine. 1286 Penny John class 5b. Ilger on London. Good very fine. 1287 Penny John class 5b. 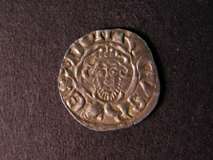 Moneyer Beneit on London. S.1351. Good very fine, slightly clipped on one side.